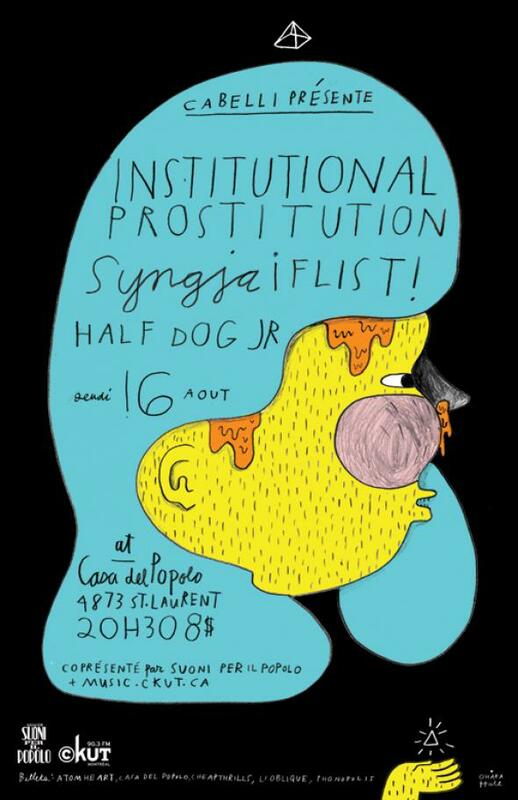 See you at Casa del Popolo tonight, August 16th, for Institutional Prostitution + Syngja + ¡Flist! + HALFDOGJ.R! When our radio programmers also happen to be excellent concert programmers, like Nick Cabelli from Cabelli Présente! Nick has programmed an excellent series of shows in August on the 16th, 18th, and 24th! Co-presented by the CKUT Music Department, the shows feature CKUT faves like Cop Car Bonfire, Dreamboy, ¡Flist!, Halfdogj.r, Hand Cream, Institutional Prostitution, Les Momies de Palerme, Mozart’s Sister, Syngja, UN et/ou We R Dying 2 Kill U and lots more. Here’s the show poster for the first show in the series, check out Cabelli’s Tumblr for more!